Video Interop Server, is a new role shipped with Skype for Business server 2015 that allow video conferencing between 3rd-party Video Teleconferencing system as in Cisco/Tandberg systems and Skype for Business server. Conversion between H.264 formats used by Cisco systems and Skype For Business. Adopting & converting the coming video stream from the Cisco VTC (Single stream, specific resolution) into multiple streams of different resolutions for use in Skype For Business. 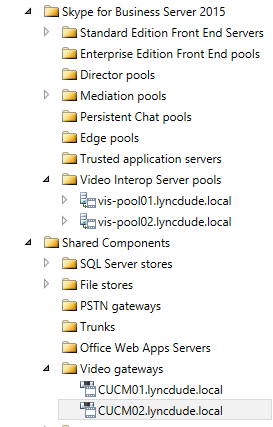 VIS currently can be deployed ONLY as a Standalone server, it cannot be collocated with other Skype For Business roles. VIS been tested and found working good with CUCM 10.5 and above. VIS been tested by “TAP Customers” with Cisco Telepresence Video Communication Server (VCS) 8.1 and found working fine, nevertheless this was not tested by Microsoft nor it is officially supported yet. Cisco devices will need to have software release TC7.0.0 or above to work as expected with Skype For Business. The Integration between both platforms are done by using SIP-Trunk. 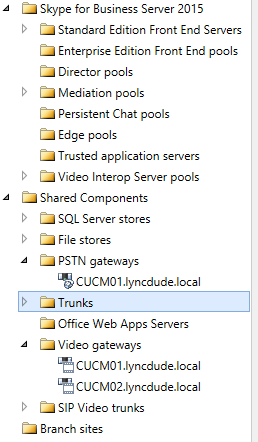 VIS to multiple CUCM trunks (1:N) is supported. Call can only be initiated from the Cisco VTC to Skype for Business, also drag and drop not possible yet. VIS cannot be used in a Hybrid deployment with Skype for business online. 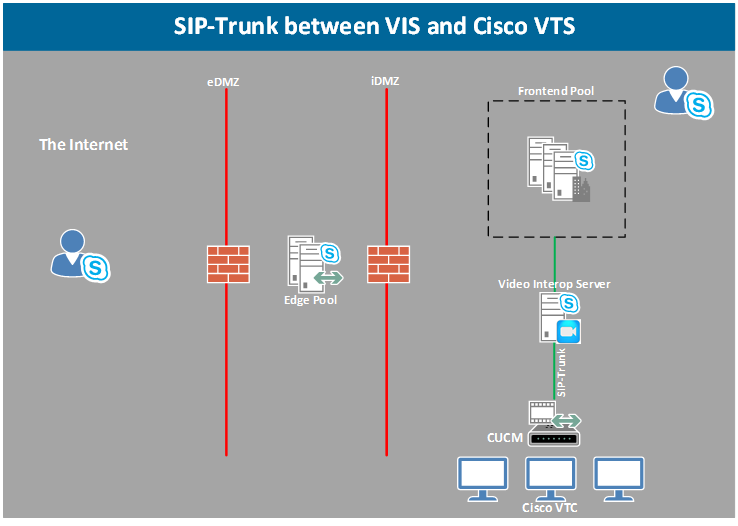 So as I mentioned previously, the integration between both platforms are done by using SIP-Trunk, the trunk will be defined on the Skype for Business topology as well as on the CUCM side, the VTC will continue registering to the CUCM, no changes here. In the topology add those two FQDN of the Video Gateways. 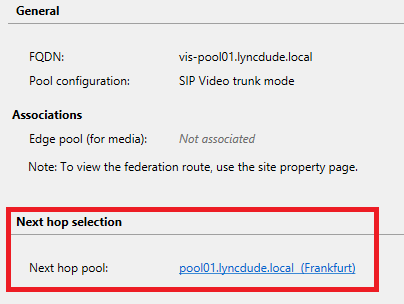 By this you have tricked Skype for Business to have the same Video gateway pointing to different VIS pools for failover. When a video call comes to the VIS from the video gateway, the VIS then forward it to the AVMCU (Frontend Pool), then the Frontend pool forward the call to the correct Skype For Business client. The VIS keep track of the availability of the Primary Frontend pool configured as the “Next Hop” in the topology. This is done by sending “OPTIONS” messages to the pool, if 5 consecutive failures messages are received, the VIS will mark the frontend pool as “Down”, If there is an online backup Frontend pool configured for the VIS, the VIS will start routing the calls to the backup frontend pool, meanwhile the VIS will keep trying with the primary frontend, and once it finds it online again, all new calls will be forwarded to the primary frontend pool, There is also always the option for the admin to invoke a failover using the Skype for Business management Shell commands. Most organization would have the CUCM serving as PSTN & Video gateways, well good news is that it is supported to have the same CUCM serving as a PSTN gateway and video gateway in the same Skype for Business topology, following screenshot you see I have one gateway “CUCM01.lyncdude.local” used as a video gateway and voice gateway for Pool01. In Part-2 I will be writing about defining a VIS in the Skype for business topology, installing the VIS and configuring it. 1) Very few CUCM deployments are running 10.5. Having to have such a new version seems a blocker to adoption. 2) Why would you run VIS and VCS in parallel other than for migration, short term coexistence? Anyway, great to see information on the new platform out and about. Is there a way to access documents describing VIS-VCS interoperability made by these customers? I’m also interested in the VIS and VCS integration solution in //.